I love the article 'Not an Introvert, Not an Extrovert? You May Be An Ambivert' by Elizabeth Bernstein. You can read it here. It's a fine example of both/and rather than either/or thinking, and of finding the third way. The trouble with politicians is that they're stuck in an either/or world. And we, who they are supposedly representing, end up with mediocrity, compromise, or worse the uncertainty bred from inaction. Don't let this happen in your home, your business, or anywhere else, rather find the third way. We live in 3 worlds, yours, mine, and ours. Only ours really matters. 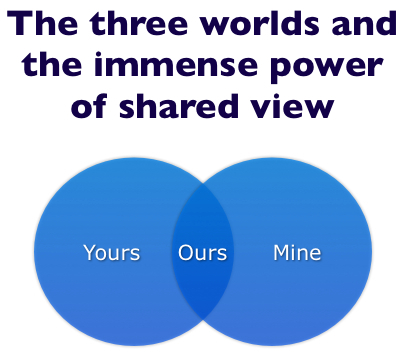 At home, at work, and at play finding and sustaining a shared-view (the third way) in 7 areas is foundational to success. I've written a blue paper about this. You can download it by clicking on Free Blue Paper here.